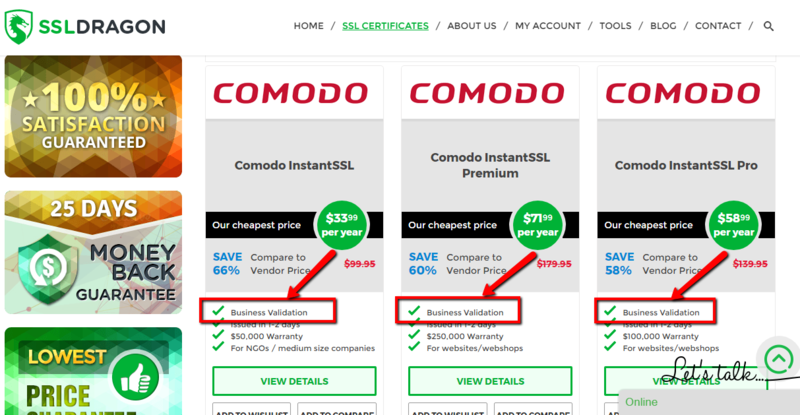 Comodo InstantSSL Pro is an easy, quick and at the same time proven way to increase your customers’ trust in your website and business. It secures one single domain and provides the standard 128 / 258 bit encryption for every user connecting to your website. So as this certificate requires a Business Validation (BV), the issuance time is between 1 to 3 business days. During this authentication process, the Certificate Authority (CA) will verify whether your business is legitimate and registered at the provided location. In this regard, the Certificate Authority (CA) will use your company’s contact information provided on an online directory, such as yellowpages.com, dnb.com (Dun&Bradstreet), superpages.com, bbb.org (Better Business Bureau) or other similar online business directories available in your geographic region, to make a call to your business office and confirm that you do your business there. This SSL will enable many trust indicators on your website. Users will immediately see the green “https” next to the padlock icon in the browser’s address bar. 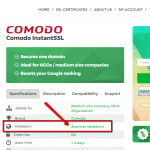 You will also receive a Comodo (now Sectigo) site seal which will provide users a quick and easy way to see your company’s name and verify your business identity. Therefore, users will be assured that your website is authentic and that any personal information which they enter on your website is protected by a highly trusted and widely used brand in the website security industry. Another benefit of this certificate is its high compatibility with the mobile devices and desktop browsers, including the old Netscape 4.7+, IE 5.01+ and Mozilla 1+. You can use it on as many servers as you want and reissue it free of charge any time you need. For your full contentment, when purchasing this SSL Certificate, we offer you a 25 days money back guarantee and a 7% or 15% discount if you buy it for more than one year. 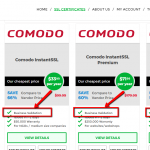 Comodo InstantSSL Pro is ideal for any medium size businesses and online shops. My client needed a BV certificate compatible with C2NET Stronghold. This one was the best to fit the budget. What is a Business Validated (BV) SSL certificate? The Business Validation (BV), also called Organization Validation (OV), SSL certificate is recommended if you have an e-commerce website that is a registered business. Besides the domain validation performed through e-mail, you will have to provide company documentation to receive business authentication. During this authentication process, the Certificate Authority (CA) will verify if your business is carried out by a legitimate, good faith company operating at the provided location. Since the validation is done manually and involves paperwork, you will receive your Business Validation SSL certificate within 1-3 business days. After receiving Business Validation, the green “https” and padlock icon will be displayed on your website’s address bar. These signs will make customers more willing to entrust you their personal and financial information. Yet, if your website purpose is to perform large sales, offer specific products/services or execute financial transactions, you should consider buying our Extended Validation (EV) certificate. This type of SSL certificate will activate the green address bar and will give your site a higher level of trust. How to pass the Business Validation for my SSL Certificate? You can check if you have a Business Validation SSL Certificate by looking at the attributes of your SSL Certificate. Please open the two screenshots on the right in order to see where you can find the information about the validation type of your SSL Certificate. Different SSL Certificate brands have different Business Validation procedures. Please read the section that applies to your SSL Certificate brand below. You need to provide information about your company and your company’s phone number as a part of the Business Validation process. There are three ways to do that. You don’t have to do all three. Doing just one of them will allow you to pass the Business Validation. 1.1) The first way is to provide your DUNS number to Comodo/Sectigo. You can get your company’s DUNS number from this website: https://www.dandb.com/. If Comodo/Sectigo gets back to you and says that your DUNS listing does not contain a phone number, then you need to contact Dun & Bradstreet (at https://www.dandb.com/) and ask them to add your company’s phone number to their “business directory and on the report”. 1.2) If you don’t have a DUNS number, then the other thing which you can do is to provide your company’s Articles of Incorporation, or Government Issued Business License, or your local organization number. Please make sure that the documents that you provide have your company’s registration number so that Comodo/Sectigo can check your company with your country’s governmental directories (e.g. : Corporation Division, Companies House, Department of State, etc). Please note that Comodo/Sectigo will be looking to see your company’s phone number listed there as well. Not all governmental directories have the companies phone numbers. If the governmental directory allows you to call them, email them, or use their website to add your phone number, then please go ahead and do that. Please provide any of the above information (from points 1.1, 1.2, or 1.3) by contacting Comodo/Sectigo at https://www.comodoca.com/en-us/support/ or https://sectigo.com/about/contact. Click on “Submit a ticket here”, select Validation Department and submit your request. Please mention your “Partner Order ID” in your message. 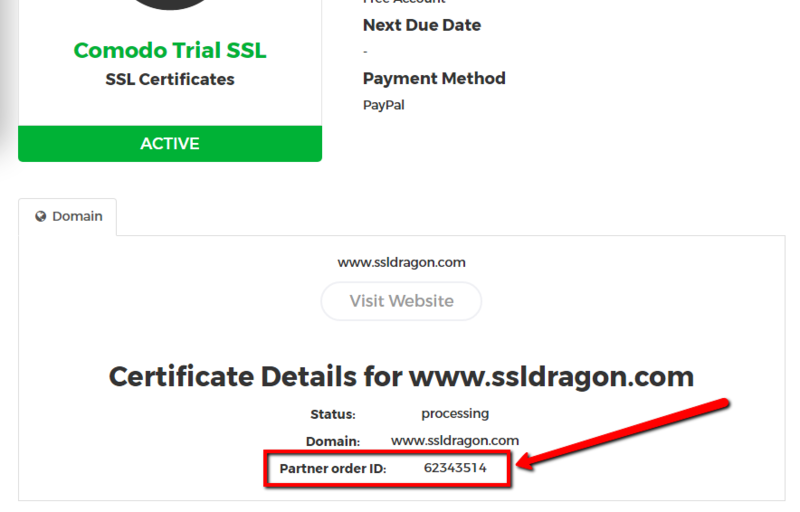 You can find your “Partner Order ID” on the details page of your SSL Certificate inside your SSL Dragon account. See screenshot on the right. If you do not hear from Comodo/Sectigo in the next 3 days after you email them the information from above, then please call +1 (888) 266-6361 (Ext 4) to check the status of your SSL Certificate with Comodo/Sectigo. When you talk to them, you will need to provide them your “Partner Order ID”. If you bought a Business Validation SSL Certificate with Thawte, GeoTrust, Symantec/VeriSign, then the certificate authority will work on validating the legal existence of your company via local public databases, as a part of the Business Validation process. This may take between 1-3 working days. Please wait until one of the certificate authority representatives contacts you about any additional information that they may need you to provide them. If you do not hear from the Certificate Authority representatives in the next 5-7 days, then please call +1 (520) 477-3152 (Ext 2) to check the status of your SSL Certificate with the Certificate Authority. Please note that Thawte, GeoTrust, Symantec/VeriSign are all owned by Symantec, and they all have the same phone number provided above. 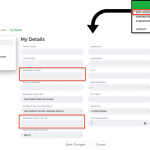 When you talk to them, you will need to provide the “Partner Order ID”, which you can find on the details page of your SSL Certificate inside your SSL Dragon account. See screenshot on the right. How to pass the Organization Validation for my SSL Certificate? You can check if you have an Organization Validation SSL Certificate by looking at the attributes of your SSL Certificate. Business Validation equals to Organization Validation. This being said, wherever you see “Business Validation” it also means “Organization Validation”. Please open the two screenshots on the right in order to see where you can find the information about the validation type of your SSL Certificate. Different SSL Certificate brands have different Organization Validation procedures. Please read the section that applies to your SSL Certificate brand below. You need to provide information about your organization and your organization’s phone number as a part of the Organization Validation process. There are three ways to do that. You don’t have to do all three. Doing just one of them will allow you to pass the Organization Validation. 1.1) The first way is to provide your DUNS number to Comodo/Sectigo. You can get your organization’s DUNS number from this website: https://www.dandb.com/. If Comodo/Sectigo gets back to you and says that your DUNS listing does not contain a phone number, then you need to contact Dun & Bradstreet (at https://www.dandb.com/) and ask them to add your organization’s phone number to their “business / organization directory and on the report”. 1.2) If you don’t have a DUNS number, then you need to provide your organization’s Articles of Incorporation, or Government Issued License, or your local organization number. Please make sure that the documents that you provide have your organization’s registration number so that Comodo/Sectigo can check your organization with your country’s governmental directories (e.g. : Corporation Division, Companies House, Department of State, etc). Please note that Comodo/Sectigo will be looking to see your organization’s phone number listed there as well. Not all governmental directories have the companies phone numbers. If the governmental directory allows you to call them, email them, or use their website to add your phone number, then please go ahead and do that. Please provide any of the above information (from points 1.1, 1.2, or 1.3) by contacting Comodo/Sectigo at https://www.comodoca.com/en-us/support/. Click on “Submit a ticket here”, select Validation Department and submit your request. Please mention your “Partner Order ID” in your message. 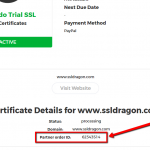 You can find your “Partner Order ID” on the details page of your SSL Certificate inside your SSL Dragon account. See screenshot on the right. If you bought an Organization Validation SSL Certificate with Thawte, GeoTrust, Symantec/VeriSign, then the certificate authority will work on validating the legal existence of your organization via local public databases, as a part of the Organization Validation process. This may take between 1-3 working days. Please wait until one of the certificate authority representatives contacts you about any additional information that they may need you to provide them.